They come in droves, like locusts hell-bent on destroying acres of land. They are tourists, and their infernal locks are destroying Parisian bridges. The Associated Press (via The Huffington Post) reports officials are now urging tourists to take selfies instead of adding to the famed bevy of love locks that adorn bridges on the Seine River. Indeed, the annoyance that is selfie photography is actually preferable to leaving a lock. 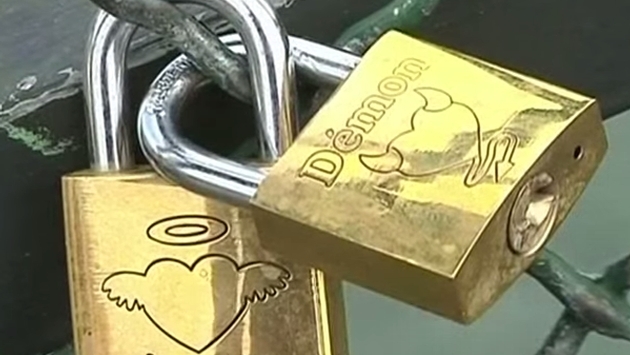 The report states, "With giant stickers in French, English and Spanish on the Pont de l'Archeveche, behind Notre Dame Cathedral, Paris began its #lovewithoutlocks campaign on Wednesday, saying the city's famed bridges 'can't resist your love' — the padlocks clinging to every available surface." This is just the latest proof that people are the worst, taking a peculiar gesture and ruining otherwise fine bridges. Look, we get that you are in love, but locking a railing and throwing away the key is one notch more novel than engraving initials in a tree. If being unoriginal is your thing, you might as well take a selfie, it will last longer and doesn’t destroy a piece of architectural heritage. Of course, it would be easy to dismiss the story if it weren’t for reports that some sections of these bridges are actually collapsing. “The dreamy Pont des Arts footbridge in central Paris was so weighed down by the thousands of locks affixed to its grillwork that a section of the fencing collapsed Sunday. No one was hurt, but it did spur a tweet from Bruno Julliard, the city's head of cultural affairs, who said it "confirms that our desire to find an alternative to these locks is a real necessity." As we know, people love taking selfies slightly more than they enjoy eating food, often waiting a few minutes as they capture the perfect lighting to photograph their mug next to their exquisite dinner. So perhaps Paris found their answer. Being a realist, we can safely say locks will continue to pepper bridges and keys will still be dropped into the bottom of corresponding rivers. Lover or lifelong significant other, there is no denying how much you love someone when a padlock purchase is necessitated. I now plan on getting my wife a padlock for our anniversary and will update on how that works out for me.